max steel wrote: What impact tsar bomba will have ? I mean can it destroy whole east coast or west coast ? It could definitely annihilate a major U.S. city like New York but a coast?? ?...No, there's a point of diminishing returns. Tsar Bomba was a 58 megaton thermonuclear hydrogen bomb, for a nuke to be able to destroy the East or West coast of the U.S., it would take a bomb that's yield is hundreds of megatons of power, but once you hit the 100 megaton threshold the majority of the energy is lost escaping the atmosphere in to outer space. A much more efficient way of destroying a coast would be to fire 100 '1' megaton nukes striking all over the coast, as opposed to 1 '100' megaton bomb, which couldn't do the job anyway. One thousand '100' kiloton tactical nukes would even do a better job destroying a coast. 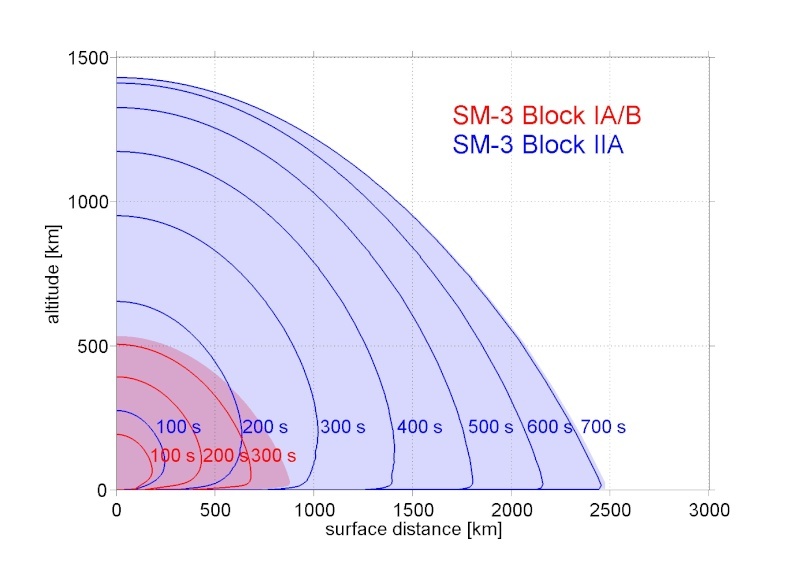 Smaller tactical nukes are not only more efficient, but smaller so that a firing platform could carry more and cover a larger area of destruction quicker than a Tsar Bomba could. It's one of the very reasons why the Russian's refuse to negotiate on tactical nukes, one of them being that the U.S./NATO refuses to remove U.S. tactical nukes stored in Europe, the other being is that Kiloton tactical nukes are far more flexible and more efficient than huge megaton strategic nukes. Take NYC and DC for example, on 9/11 it proved that the NORAD and other U.S. aerospace defense forces are frauds and charlatans, they couldn't defend their own airspace against 'goat-herding' troglodytes, how are they supposed to defend the U.S. from Russian and Chinese tactical nukes?!?! If the 9/11 hijackers were a far smarter enemy (such as Russia and or China) they could of attacked a much more strategic soft target such as the old and dilapidated Indian Point nuclear facility (which is still in use) based in NYC, it would of been far more devastating in comparison...like being the world's largest dirty bomb...with that being said you could see why ABM's in Europe is such a suicidal endeavor. Enough of this BS talk of nuking US or vice versa. Not gonna happen anytime soon. MOSCOW, September 6. /TASS/. Russian parties, which are not represented in the parliament, are indignant about the information about a meeting in Kostroma of U.S. diplomats and Russian oppositionists. "This situation is abnormal, as it is not just a meeting of some representatives of a foreign country (as international contacts are necessary), but a meeting of an embassy staff, those, who are involved in promoting of their country’s foreign policy," Vyacheslav Maratkanov of the Right Course Party. He said a meeting between diplomats and parties "is beyond activities of an embassy." The politician said the meeting featured Bradford Bell, First Secretary of the U.S. Embassy, who, he said, is a "professional provocateur, used to work in the Balkans, has been participating actively in "promoting of democracy" to the south and south-east." Maratkanov said "consultations of the kind are a bad sign on the eve of elections to the State Duma (Russian parliament)." He paid attention to how the Russian opposition behaves during the current election campaign. "We participate in elections in six regions," he said. "We are opposition. Though the constructive opposition. At regions, where non-constructive opposition participates, they are not interested in results, they do not discuss regional agendas, no, they are using federal resources and absolute denial. Those are ideas of those who finance them - foreign funds." Head of the Rodina (Fatherland) Party, a deputy of the State Duma, Alexei Zhuravlev said the U.S. diplomats had requested a meeting with his party in Kostroma. He wants to file an inquiry with the Russian Foreign Ministry regarding the actions of the U.S. representatives. "They did request, persistently, called with a share of boldness," he told TASS on Sunday. "They were told immediately we are not going to have any meetings, we do not have any interests with the U.S. embassy." He said representatives of the embassy at least ten times called his colleagues in the party asking for a meeting in Kostroma. The politician says it might have been a "shelter operation" for a meeting with oppositionist Alexei Navalny and other representatives of the opposition. The party leader said he had filed an inquiry with the Foreign Ministry and would "make another inquiry to the Foreign Ministry if they have ever allowed the meeting. The media earlier published information about a meeting in Kostroma between the U.S. diplomats with representatives of political parties, including with Alexei Navalny. So the Rodina party has decided to file an inquiry to the foreign ministry over this, and this could have implications for US personnel working at the embassy. The political fallout may try to be softened by both sides, but Russia could actually go as far as do what Venezuela did by limiting number of US staff available at the embassy, and potentially kicking out the ambassador. How does an inside job proves norad or usa air defence inefficiency ? They were allowed to execute a false flag so that usa can justify its till date war on terror. Its seems like tensions between Moskva and Washington DC gets into sports. Mixing up anthems is a trap that many events and organizations have fallen into. The World Wrestling Championships in Las Vegas has followed suit, with the award ceremony paused mid-song, followed by an awkward version of the correct tune. Two-time Greco-Roman wrestling world champion Roman Vlasov (2011, 2015) had to defeat two world champions en route to the finals, where he faced Danish Mark Madsen. The Russian thought all his hard work had finally paid off, and it was time to relax and bask in his glory. But several seconds into the song he realized that something was very out of place… that’s because the song that was blasting through the speakers was actually Mikhail Glinka’s ‘Patrioticheskaya Pesnya’ (Patriotic Song) – a piece very briefly used as the Russian anthem during the tumultuous ’90s, before Vladimir Putin’s administration reinstated the world-famous melody at the turn of the millennium. As Vlasov stood there, dumbfounded, someone must’ve caught on to his look of surprise, because the song was finally paused. That came only at the 49-second mark, however. The champion then politely gestured to whomever was in charge to correct the mistake. According to Kommersant daily, the champ refused to come down from the pedestal until the Americans played the correct anthem. “I didn’t immediately realize what anthem was playing. But when the music stopped, I told the organizers I wouldn’t budge from the spot until I heard the real Russian anthem,” he said. Championships management promptly corrected the mistake, but followed it up with a rather giddy and cartoonish version of the current Russian anthem. Only two days ago, the boss of the Russian Wrestling Federation, Mikhail Mamashvili, was denied a visa to the US. No explanation was offered. For Vlasov, the win became the second in his career. The athlete is also an Olympic champion in the under-74kg category. higurashihougi wrote: Its seems like tensions between Moskva and Washington DC gets into sports. Here's the video, not sure why the hell they put such a ridiculous version of the Russian anthem on considering when you search youtube for the Russian anthem it's the very first result, so who ever did this must have really work hard looking for such an odd version of the anthem. Germany to be a Nuclear Ash Heap? If Germans do not bother to protest and demand these Americans leave or at least get rid of the nukes, then Germany only gets what it deserves if the US ever starts a war. As much as those tactical nukes are nothing compared to even soviet tactical nukes, it is still a dangerous precedence. Do you guys think they have thought these things through... are they really ready to play this game now, or is this biting off more than they can chew. sepheronx wrote: If Germans do not bother to protest and demand these Americans leave or at least get rid of the nukes, then Germany only gets what it deserves if the US ever starts a war. As much as those tactical nukes are nothing compared to even soviet tactical nukes, it is still a dangerous precedence. People are entirely castrated here in germany. They will go full nuts and militant if Germany would ban even one single WM or EM of football participation for our "national" team, they have and will riot for such garbage or when you would ban the useless disgusting drinkfest the Oktoberfest "Wiesn", but screw it lets bring nukes here, lets build secret military facilities and torture camps of the US here, lets be vassals of the US, openly admitted by our politicians and still in conversations with our retarded population they still like the politics of Merkel, Schäuble the entire Coalition and all the rest of vassals a good thing. People are stupid in its true form and meaning of this word. A rational and logical thought is absolutley incompatible with stupid people. So a 3rd world war will happen, the german people will be again the cannon fodder for the degenerated german tribe the anglo-saxons. I think that is a fitting thread for that video. Russian moderator completley destroys american "journalist" about his mumblings and rantings against Russia and US "competence" against ISIS. Werewolf wrote: I think that is a fitting thread for that video. I can't speak Russian, but I can tell that Presstitute's accent is uglier than a pile of dogshit!!! I am sorry there wasn't subtitles in english but you can go to that video on youtube and use the subtitles in english manually. Yes, such vocal recognition subtitles aren't really good but maybe they are good enough to understand, haven't tried them for that video, have no reliance on translators for russian. Wanted to ask a question, are the Republicans the most anti Russia American political party? And which US party are more lenient towards Russia? By the way, why do people call Tea Party as an extreme party? Don't know much about the US political parties. andrewlya wrote: Wanted to ask a question, are the Republicans the most anti Russia American political party? And which US party are more lenient towards Russia? By the way, why do people call Tea Party as an extreme party? Don't know much about the US political parties. They are right wing extremist parties and no republicans are not lenient towards Russia. You need to understand US isn't a democracy and both dems and repbs are nothing but stooges getting bribes aka lobbying to push their agendas. It's a corrupt oligarchy. That's how fascism works in US. 47.87% of whom voted for Bush (48.38% voted for Gore). In other words, out of all eligible American voters, 25.9% voted for Bush. He won, of course, despite Gore receiving more votes, as Putin pointed out. But can you imagine a Russian journalist asking David Cameron a question like this? "Mr. Cameron, given the horrific abuse of power by the Obama regime, the violence against peaceful protesters and the murder of civilians by the security services called the 'police', how do you envisage the shape of any peace process and eventual settlement in the United States? Is the U.S. ready to accept, for example, a partition for the U.S.? Will Mr. Obama ultimately have to stand aside? And if he does, what kind of leader might replace him?" 51.06% of whom voted for Obama. Thus, 29.7% of eligible voters voted for Obama. That's not bad, or at least it's not as bad as the Bush election. 63.64% of whom voted for Putin. Thus, 41.5% of Russian voters actually voted for Putin. Even better! And better yet, 90% of Russians, regardless of if they voted for him or not, support him and think he's doing his job well! In contrast, Obama's approval rating is sitting at around 46% - hardly a base of popular support. 88.7% of whom voted for Assad. So, 65% of Syrians voted for Assad. This was in the midst of a refugee crisis. While many countries allowed Syrians within their borders to vote at their respective embassies, Belgium, Canada, Egypt, France, Germany, Saudi Arabia, Turkey, UAE and the United States did not allow the elections to be held in their Syrian embassies. Two out of every three Syrians voted for Assad. One out of four Americans voted for Bush. One out of three Americans voted for Obama. Obviously something is wrong with this picture. 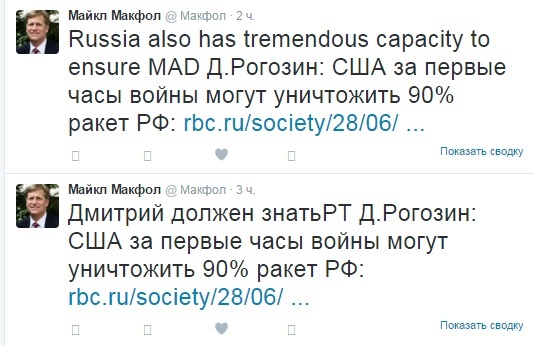 Former US ambassador to Russia, McFail, claims that the US can take out 90% of Russian ICBMs in any confrontation. All I can say is: McFail and his bosses are certifiable retards. The question should be brought up to him that what system is capable of doing that? Since PAC 3 proved it couldn't handle Scud missiles which Russia has not operated in a very long time, and Russia's nuclear arsenal are in ICBM's. Or does he mean the Aegis destroyers? Cause as well, such systems are incapable of dealing with anything more than a 1,000km two stage missile, which is also questionable in the method of testing. Or THAAD? Which also failed most of its tests. I think they need to re-work their propaganda. Cause there is enough evidence to prove that these systems are ineffective yet they still spew it, even if the data is open. I wonder who they are fooling? Themselves or their people? The other 10% of missiles would cause so much devastation that the whole point is moot anyway. sepheronx wrote: The question should be brought up to him that what system is capable of doing that? Since PAC 3 proved it couldn't handle Scud missiles which Russia has not operated in a very long time, and Russia's nuclear arsenal are in ICBM's. The problem is that this statement reveals a dangerous delusion of the US elites. They actually believe they can win a nuclear war with Russia. This statement by McFail has let the cat out of the bag and it explains why the US and its minions are so brazen. statements so I fell into a bias trap. But by installing Missile shield in Europe , one day their wet dreams will come true . If Russia does counter ABM deployment in Eastern Europe with short range ballistic missiles and improved reentry vehicles/boosters, we have the exact situation that the ABM treaty was designed to prevent. Russian activists are requesting permission to install a monument near the US embassy in Moscow dedicated to the genocide of American Indians. A member of the Russian Public Chamber says the move could soon get official support. According to the author of the document, the request will be forwarded to Russian President Vladimir Putin, Moscow Mayor Sergey Sobyanin, and to the Russian Public Chamber. Public Chamber member Valery Korovin said in comments to RIA Novosti that the petition was timely and official support for it was very likely. “The initiative to install this monument is very urgent today because it would remind everyone how the history of the United States started. It must become a silent reproach to the modern-day American elites who have seriously diverged from the ideals that were made a foundation of American statehood,” Korovin told reporters. “Without the repentance of US society it is impossible to talk about this country’s leadership. The United States now has no moral right to speak about the rights and freedoms of any ethnic groups,” he added. Fully aggree and support the Monument for native americans who were the factual real people subject to the biggest genocide in human history.